On Wednesday 1st February, a boy was martyred inside his shop while his cousin was injured by the internal mercenary forces in the main bazaar of ‘Sabary’ district of ‘Khost’ province. On Thursday 2nd February, houses of civilian people were raided by savage foreign invaders collaborated by their internal stooge forces in ‘Chamtali’ area of ‘Surkh-Raud’ district in ‘Nangarhar’ province, in which, seven innocent villagers were incarcerated after thoroughly searching their houses and severely beating several other innocent people. On Thursday 2nd February, it was reported by Kabul based ‘Shamshad’ Television that a sixteen year old boy was martyred by the border police-force in ‘Tandi Marghay’ area of ‘Barmal’ district in ‘Paktika’ province. On Sunday 5th February, a local villager was martyred in the indiscriminate helicopter shelling of foreign invaders in ‘Doulat-Zai’ area of ‘Chaprihar’ district in ‘Nangarhar’ province. On Monday 6th February, three innocent civilians were martyred and four others were injured in the indiscriminate mortar shelling of local incompetent stooge forces in ‘Maidan’ area of ‘Alingar’ district in ‘Laghman’ province. On Thursday 9th February, heavy losses and casualties were inflicted on civilian people in the brutal and indiscriminate bombing of savage foreign invaders near the main bazaar of ‘Sangin’ district in ‘Helmand’ province. In this relentless air raid, 26 innocent people most of them women and children were martyred and 13 others were injured. Similarly, a Mosque and two civilian houses were demolished in this blind bombing. In the beginning, both the heterogeneous puppet setup and their foreign invading masters denied the civilian losses; but later, it was confirmed by them that heavy losses and casualties were inflicted on civilian people in this felonious act. On Saturday 11th February, 5 members of one and the same family were martyred and 8 others were injured in the brutal and blind bombing of foreign invaders in ‘Haji Amin Aka’ area of ‘Sangin’ district in ‘Helmand’ province. On Sunday 12th February, five innocent civilians were martyred in the indiscriminate bombing of mercenary forces of puppet regime in ‘Shalie Nawa’ area of ‘Khas-Urzgan’ district in ‘Urzgan’ province. On Thursday 16th February, a 75-year-old white-bearded civilian was martyred and another civilian was wounded in the indiscriminate artillery shelling of internal stooge forces in ‘Gor-Zad’ area of ‘Shirin Tagab’ district in ‘Faryab’ province. On Sunday 19th February, ‘Hashim Khail’ area in ‘Khogyani’ district of ‘Nangarhar’ province was raided by brutal foreign invaders and their internal mercenary forces. In this savage raid, main gates of several houses were broken; local people were severely beaten; their valuables were stolen; an innocent villager, named ‘Arif’, was relentlessly martyred; and 6 Muslim preachers staying in the mosque, and 4 other villagers were taken away as prisoners. 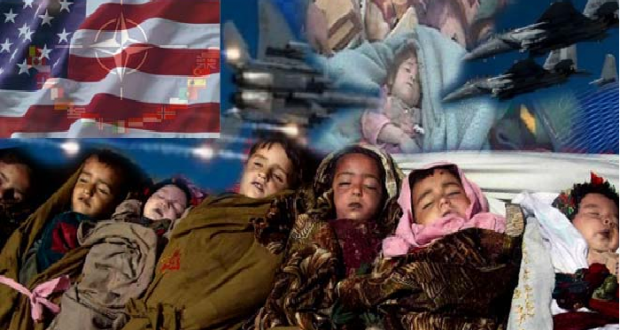 On Monday 20th February, a female-child was martyred and four others, including children and women, were injured in the indiscriminate artillery shelling of local stooge forces in ‘Naiknam-Kala’ area of ‘Zurmat’ district in ‘Paktia’ province. On Tuesday 21st February, an innocent civilian was martyred and another one was injured by the unrestrained and notorious Arbaki militiamen in ‘Sang Charak’ district of ‘Saripul’ province. On Wednesday 22nd February, 10 civilian people were martyred and injured in the random artillery shelling of local amateurish forces in the central area of ‘Dasht-i-Archi’ district of ‘Kunduz’ province. On Wednesday 22nd February, four innocent villagers were incarcerated by the savage foreign invaders during a raid on ‘Bat Khaila’ area in ‘Nau-Bahar’ district of ‘Zabul’ province. On Wednesday 22nd February, two innocent civilians were injured and three others were imprisoned during a raid of foreign occupying forces escorted by their local mercenary forces in the suburbs of ‘Ghani Khail’ district of ‘Nangarhar’ province. On Wednesday 22nd February, a house was hit by a mortar shell, indiscriminately fired by the incompetent stooge forces of puppet regime in ‘Husain Khail’ village of ‘Alla-Sai’ district in ‘Kapisa’ province. Three women, including a bride, were martyred and a man was injured in this incident. On Thursday 23rd February, 6 shops and 2 orchards were demolished by the local in-security forces near the main bazaar of ‘Farah-Raod’ district in ‘Farah’ province. On Friday 24th February, an innocent civilian (named ‘Faizullah’ s/o ‘Mohammad Sarwar’) was relentlessly martyred by the local notorious Arbaki militiamen in ‘Khado-Khail’ village of ‘Aab-Band’ district in ‘Ghazni’ province. On Friday 24th February, 4 women were injured during a raid of brutal foreign invaders collaborated by their internal mercenary forces in ‘Loi-Kanam’ area, near the capital city of ‘Kunduz’ province. On Saturday 25th February, local civilian houses in ‘Chabarma’ and ‘Amin-Abad’ areas near the capital city of ‘Kunduz’ province were raided by the savage foreign invaders and their mercenary internal special forces, in which, main gates of several houses were blasted, several villagers were badly beaten and threatened, and finally, two of them were taken away as prisoners. On Saturday 25th February, the ‘Lyceum of Moulavi Habib-ur-Rahman’ (situated in ‘Basram’ area, near ‘Mehtarlam’ city, the capital of ‘Laghman’ province) was hit by a mortar shell, indiscriminately fired by the local stooge forces, in which, two students were martyred on the spot, and seven other students including one of their teachers were injured. This tragic incident was strongly condemned by the local people and the corpses were kept in front of governor office to demonstrate their protest. On Saturday 25th February, several local civilian people were badly beaten and two of them were imprisoned in a joint raid of brutal foreign invaders and their local mercenary forces in ‘Kankarak’ area of ‘Surkh-Raud’ district in ‘Nangarhar’ province. On Sunday 26th February, two innocent civilians were martyred in the indiscriminate bombing of internal in-security forces in ‘Pachak’ village near ‘Gurag’ bazaar of ‘Khak-i-Afghan’ district in ‘Zabul’ province. On Sunday 26th February, a local Mulla-Imam (the one who leads congregational prayers) was martyred and several other villagers were incarcerated in a joint raid of foreign occupying forces and their internal mercenary forces in ‘Buz-i-Kandahari’ area, near the capital of ‘Kunduz’ province.